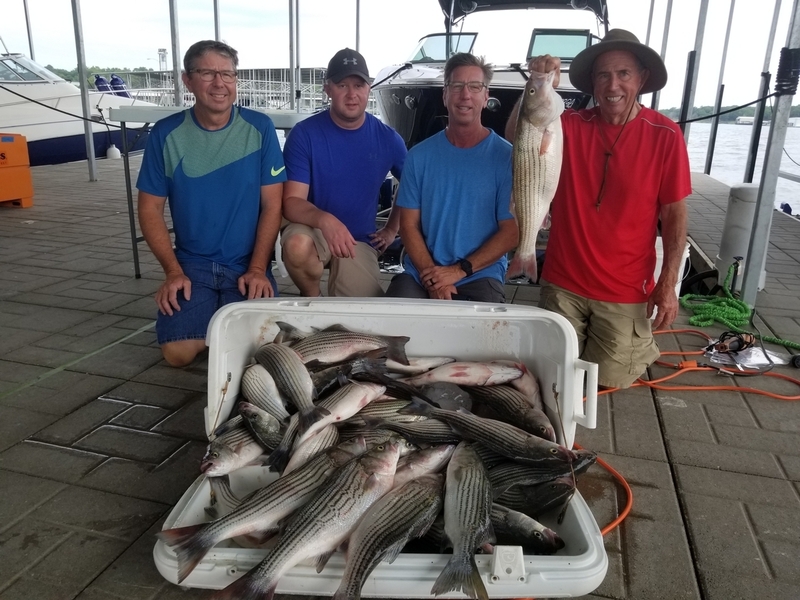 Lake Texoma Summer Fishing can be a lot of fun with Big Striper Fish and good numbers of Striper if you know the good Lake Texoma Fishing Spots. Here are my top 5 Lake Texoma Fishing Spots. Any of the following spots on any given day can hold Big Striper and good quantities of Striper as well. My #1 Lake Texoma Fishing Spots for Lake Texoma Summer Fishing is STRIPER ALLEY. This area is located along the south shoreline bluffs from the Lake Texoma Denison Dam, along the bluffs and up to Grandpappy's Marina. 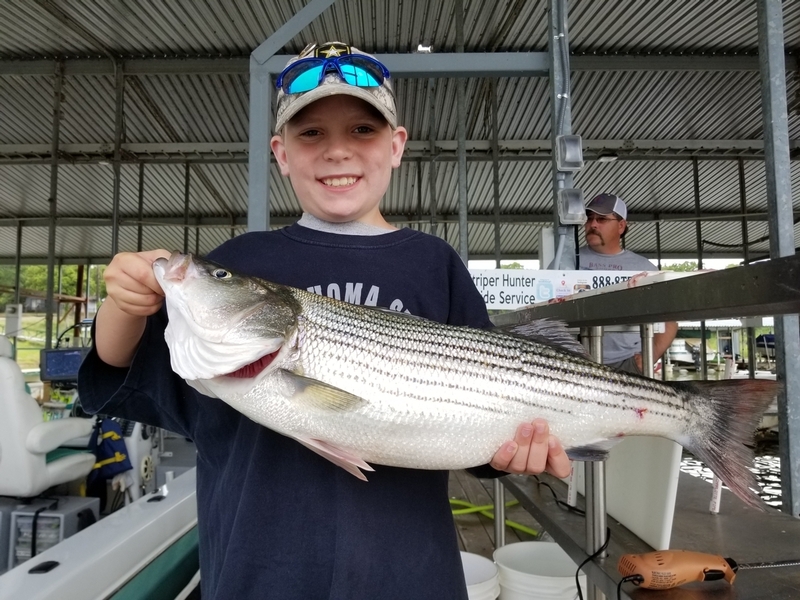 Beginning in late June or early July, Lake Texoma striper have completed their annual spawning run up the rivers and will return to the deep, cool, and clear water located down by the dam. Around sunrise, large schools will form in the deeper water near the dam and will begin to push bait up on the bluffs and back up the lake towards Grandpappy's Marina. Fish will be schooling on top some mornings, or other mornings they will just appear in deep schools with perhaps a Blue Heron or a Great White Egret hovering above the school of Striper as they eye the Striper in the deep water. These Striped Bass can be caught on swim baits if they are schooling up on the surface of the water or if they are down deep you can drop a 2 to 3-ounce slab spoon down through the school and reel it back to the surface as fast as possible. The fish will hit the slab either on the fall or on its way back up through the school. If you're on a school of Striper and they disappear, keep moving towards Grandpappy's Marina. They will follow that path along the rocks and out and deeper water. The bigger fish will typically be on the front end of the school. If you think you have outrun the school don't be afraid to backtrack or look out in deeper water. Sometimes their schooling path will change because of the boat traffic pressure. Close to the same area as Striper Alley, my #2 spot for Lake Texoma Fishing Spots is EAST or WEST BURNS RUN. This area is located beginning on the north side of the Lake Texoma Denison Dam and runs back towards the West and then up the East shoreline of Lake Texoma. Early morning stripers schooling up on the surface of the water can be fairly common in the summer in these areas. Topwater lures such as a Chug Bug or Pencil Popper can be great for some good topwater action. Swimbaits will also work as well on shallow schooling fish. In the deeper portions of West Burns Run, ripping slabs up and down through the schools in the deep water will get you some good results as well. If the fish are schooling up on the surface, try not to use your big motor running into the schools of fish. The fish will scatter and moved out into the deep water. Always coast into topwater schooling striper with your big motor off or your trolling motor on. Summertime Striped Bass can be in as shallow as 5 feet of water or as deep as 70 feet, so don't be afraid to look around shallow and deep if you have lost the school. Searching for Striper in shallow water is very easy with a side scan sonar. This allows you to look at shallow water without actually taking your boat into that area. I use this feature all the time on my Humminbird Electronics. My #3 go to spot is PLATTER FLATS. This area is located midway along the east bank of Lake Texoma. This area is a large flat that is approximately 12 to 17 feet deep with numerous creeks and channels running throughout the flat. These creeks and channels are highways for the Threadfin and Gizzard Shad…two of the Striped Bass's favorite meals. The Striper will chase these Shad through these river highways and up onto the shallow flats resulting in some spectacular topwater action at times. Early morning and late evening in this area can result in some spectacular fishing trips. One unique feature about Platter Flats is the fact that there is a very deep river channel just to the west of that area. Striper will also run along this deep water ledge on the West portion of Platter Flats. Very similar to Striper Alley, these fish will run up or down this ledge chasing bait sometimes being on the surface but most times being in the deep water ready to eat a large slab spoon if it is dropped down to them or reeled back up fast through the school. Another useful technique for this Platter Flats area is to do long drifts across the flats in 12 to 17 feet of water. Get your favorite swimbait tied on such as a Sassy Shad or Swimmin’ Fluke and simply cast out and let it sink to the bottom and reel it slow keeping it just off the bottom. Fish will scour this shallower area picking up injured baitfish that are resting on the bottom after being wounded from aggressive topwater fish in the area. Once again, utilizing my side scan I can see if there are fish in the area allowing me to fish the most productive areas on Platter Flats. The #4 spot on my top five Lake Texoma Fishing Spots is WASHITA FLATS. This area is located between soldier Creek and Washita Point. This is a flat that has shallow water as well as some good 40-foot water as well. There's also a river channel that runs on the east and south side that can result in some good ledge fishing with slab spoons or swimbaits. With a good south wind, Shad will blow up onto the northern shallow part of Washita Flats along the shoreline. This can be a great area for early-morning topwater and early-morning schooling fish. Once again, grab your favorite topwater lure and cast into these areas for some line stripping fun. Washita Flats is also a great area for working slab spoons from the bottom. Fish will gather in large schools hugging the bottom in this 25 to 40 feet of water on Washita Flats. Long drifts on your boat bouncing slabs from the bottom can have good results. There are also several creeks that run through the Flats as well that will give you some structure to fish such as ledges and humps. Drifting across the ledges or over the humps bouncing slabs on the structure holding Striper is a wonderful technique for Lake Texoma Summer Fishing. And last, but not least, my #5 Lake Texoma Fishing Spots is the ALBERTA WALL. This is an area of bluffs that runs north from Washita Point to Alberta Creek along the west side of the Washita River arm that feeds into the northern portion of Lake Texoma. These bluffs do have some shallow water along with deep water access which is a favorite for Lake Texoma Striped Bass. Early morning topwater schooling can be found along the shallow water points on the Alberta Wall. Once the sun gets up and the fish move out deep, the same slab spoons technique can be used in this area as well. Drop your 2 to 3-ounce slab down through the school of fish and reel it back to the surface as fast as possible. When striper are feeding on slab spoons while they're falling to the bottom, you have to be quick. Keep your hand on your reel handle and if you feel anything at all you have to click your handle over and set the hook to stop that slab and bury the hook into that Striped Bass. Once you have caught a couple of Striper with the slab spoon “on the fall” you will have figured out a wonderful technique for catching suspended Striper in deep water. Good luck out there on Lake Texoma. I will see you on the water, be safe!